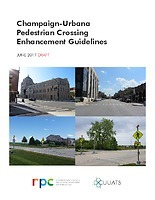 The Champaign-Urbana Pedestrian Crossing Enhancement Guidelines is intended to serve as a reference guide for CUUATS member agency staff, citizens, and developers when determining the best engineering solutions to pedestrian safety concerns, particularly with regard to the location and design of crosswalks, pedestrian signals, and other elements of pedestrian safety. In the past, CUUATS has developed crosswalk guidelines for the University of Illinois District; however, a mechanism was needed to evaluate proposals for new crosswalks or changes to existing crosswalks that is consistent across all jurisdictions in the urbanized area. These guidelines aim to standardize and fairly determine warrants for installation of pedestrian crossing improvements. The Champaign-Urbana Pedestrian Crossing Enhancement Guidelines were approved by the CUUATS Technical and Policy Committees in September 2017.